View into the bottom box. The cluster is more on the south side of the box, which is typical. I may have underestimated the colony in the Warré Hive. Simply watching the hive entrance, traffic has been much lower in comparison to the parent colony living in the Top Bar Hive. 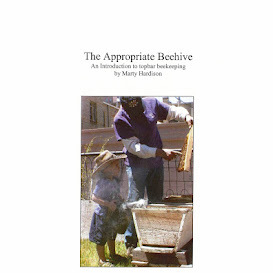 Conveniently, though, the bottom hive body has an observation window, and the bees have finally grown into it. Or maybe they're just hot and it's a good place to beard. I can't see if any comb is being built here. If so, let's hope they are properly centered on the top bars, as the only encouragement the bees were given were paint stirrers to festoon on. I didn't even coat them with wax! NOTE: this month went down in the almanac as the warmest June in Denver's recorded history.